uber-freeflight modeljetplane-ista [ ] Howard Metcalfe was at Middle Wallop over the weekend. Monday was apparently a 'wash-out' (an all too common thing, alas, this year), but Sunday was a bit breezy but flyable. The photos below were lifted from James Parry's 'Sticks and Tissue' newsletter. Howard promises to give us a brief report when he has recovered. The good flights, he says, were great, but resulted in a long long walk! Above: Howard's jets. Presumably upside down to stop them blowing away. 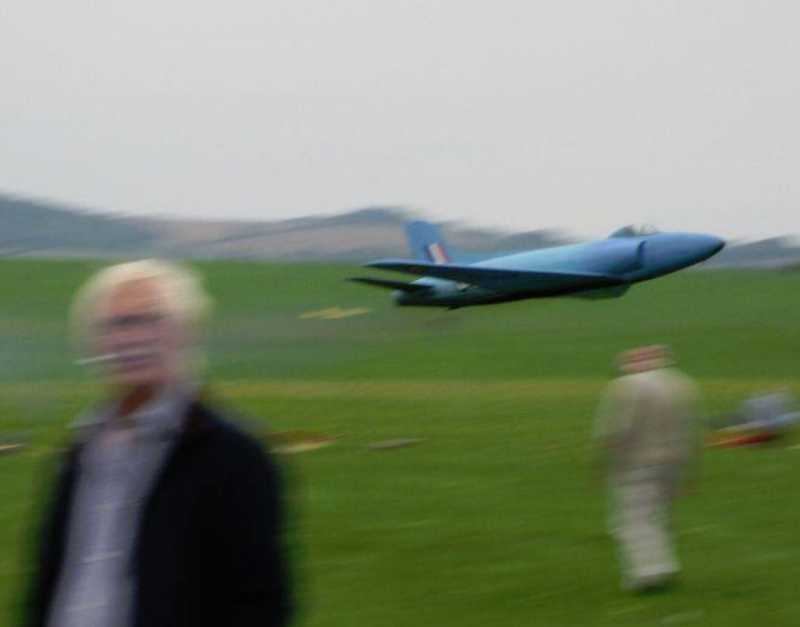 Above: Nice action shot of Howard's blue Swift. Above: Swift in glorious and realistic flight. Howard comments that the latest L-2 X Rapiers are great for this quite large model, but overpowered his newly-trimmed Cougar. This looped into a model box. We (Howard and I) reckon the L-2X gives 220-240 mN, and the standard L-2 Rapiers only 100 mN. Above: Howard was not the only rocket flyer. A rather nice Jetex Flying Wing. More later on this topic! "Someone was flying a hell of a fine flying white jet there. It circled very fast for ages but too far away to see what it was". As Roger has mentioned, the only day of the weekend that looked at all flyable was the Sunday. So there was a fair turnout with plenty of action on the field despite the steady 8mph, wind which rose to 12 mph around 3pm, so we called it quits then. Besides me the only other flyer that I saw there wielding Rapiers was Bob Pickernell with his Jetex Flying Wing. Iit flew very nicely after he had sorted out trim and would you believe this was his fifth – he must love them. 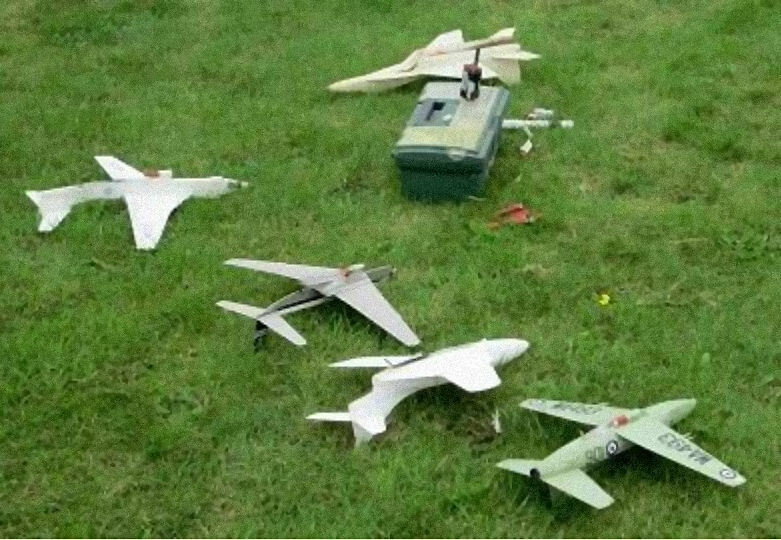 The first pic shows the usual bunch of profiles that I was flying - the Comet, Valiant, Viggen and Mig 29 plus my built up KK Attacker and new Grumman Cougar. Out of the picture were my Viggen and Swift that were still hiding in the hangar/box. As Middle Wallop is a large grass airfield there is not usually a lot of turbulence there once you are out away from the hedgerows and trees, but the cars upwind of the flight line area can cause a bit, so a lot of the flyers move further down wind to keep out of it. This was nearly the demise of my Cougar as after two rather low and tame flights on standard L2’s, where it started to mush at the end of the power run, I tried it on an L2X. Having flown a few of them I reckon that the current L2X’s are twice the power of an ordinary L2, and the Cougar tried to loop and circle at the same time resulting in a slanted loop, the low end of which was very near the ground. It eventually collided at speed with someone’s box and trolley, ugh . It’s not too badly damaged, so I’m taking it on holiday to finish the repairs which are already well on the way. I’ll try it next time out without a down thrust tab on an L2 and if that doesn’t work I try it on an L2X with a bigger tab instead. 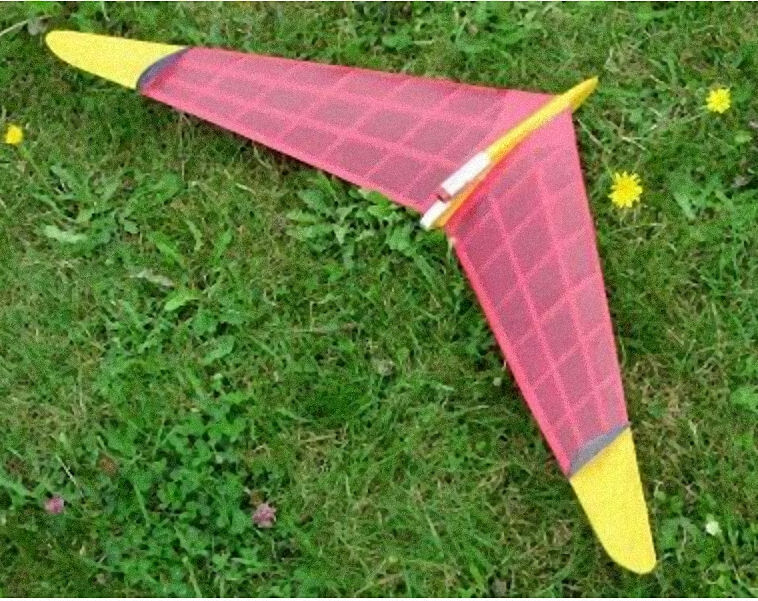 I did a number of catapult launched test glides of the KK Attacker and it looks promising: the wings stay on now until a tip contacts the ground and they come off as intended, but sadly I thought it too windy to test fly and chickened out as I know it only likes to fly straight!! Pity as I was looking forward to seeing it in the air again. 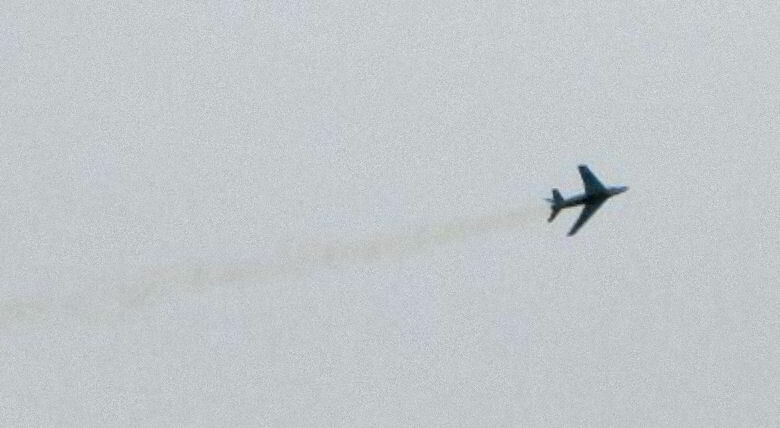 The Mig 29 needs an L2X and behaved well too, looking very realistic at a distance with the usual dirty smoke trail of a Russian aircraft, very satisfying. Now that I have fitted a larger down thrust tab on the Viggen it goes quite well if a little draggy and slow even on an L2X, it must be those large air intakes but finally I am pleased with it, perhaps it’s time to finish it off properly. As for the Swift, well what can I say, it was great and performed out of its socks on an L2X. I catapult launch it to ensure a clean launch with a couple of rubber bands looped together, a simple pin under the nose suffices for a hook and off it goes. I found that the all theL2X’s required drilling out to ensure instant ignition, whereas most of the L2’s started OK without any drilling. Every now and again though I had to drill one out a mm or two, a great days flying and I didn’t even fly one rubber or diesel model! Note added by Roger: We reckon the latest 2015 L2-X motors give more than 200 mN, which is rather more than expected. The Standard L-2's give half this (but for 20+ seconds, very nice). So we are in a bit of a quandary as most of our models have been designed and built for 140 mN and are over-powered by 200 mN. Result: a high speed loop into the ground. It may be possible to tame these L-2X motors by drilling out the nozzle. Plea to Dr Z: can we have 140-150 mN for 2016, please?